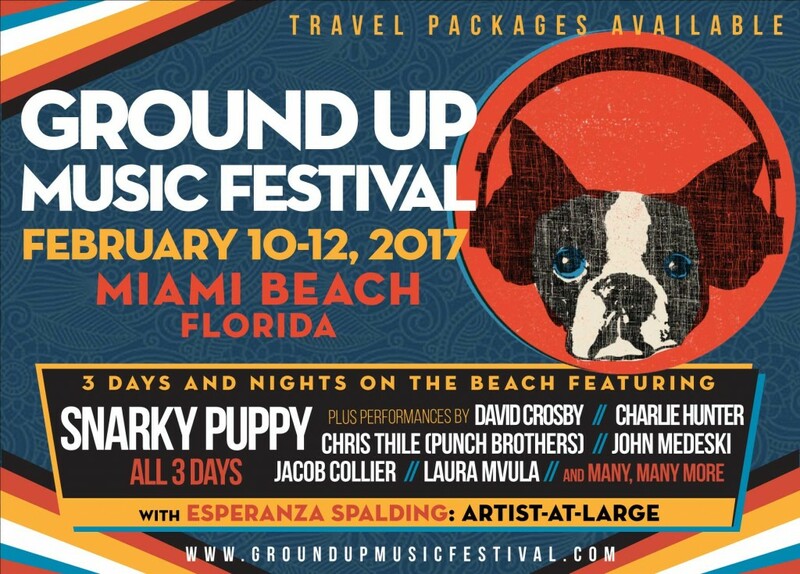 This February 10th thru 12th, Snarky Puppy and their label GroundUp Music present the first ever GroundUp Music Festival at the North Beach Bandshell. The two time Grammy award winning band will not only perform their exciting blend of R&B, jazz fusion, funk and exquisite instrumental interplay each night but also host an eclectic line up of internationally recognized musical talent. From Rock & Roll Hall of Fame inductee David Crosby to celebrated Cuban conguero Pédrito Martinez, GroundUp is sure to tantalize your musical palette with unique flavors and an artful mastery only possessed by those brave enough to pursue their talent to the highest level. Speaking of palette some of Miami’s top chefs will be providing http://www.achaten-suisse.com/ the eats and libations. As day turns to night the party continues with two late night stages at the Deauville Beach Resort, site of the Beatles’ first U.S. appearance after the Ed Sullivan Show. See more on the after parties at the bottom of this post. GroundUp Music choose to limit capacity to only 1500 attendees creating an intimate experience that goes beyond the typical festival to include special events such as workshops, film screenings, masterclasses, music business panels and even a scavenger hunt. Many of these events will take place at the Deauville providing intimate informal interactions with the artists. Miami native and former YoungArts CEO, and now GroundUP Music Executive Director, Paul Lehr explains the vision best stating “we’re creating an immersive experience where the fans can appreciate the music up close in a setting with great acoustics surrounded by an idyllic park and beach, and actually interact with the legendary artists”. Many festivals of this caliber have chosen locations such as Mexico and the Dominican Republic but Snarky Puppy chose Miami with the goal of making a lasting impact on our community. Ground Up Music Festival is an opportunity to experience music in its purest form from rare international talent who could only be brought together by what Downbeat Magazine deemed “the most popular jazz band on the planet”. As a huge Snarky Puppy fan, I was very excited to see the announcement that GroundUp Music Festival would be in my backyard at North Beach Bandshell. How did GroundUP Music Festival come about? Michael League: The idea of starting a music festival has been in my mind for many years, but I never really thought of it as realistic until Andy Hurwitz, who’s the president of our record label GroundUP Music, suggested it last year. He seemed confident and comfortable and felt like this was the right moment in the band’s career where we could host something like this. So, I rolled with it. We don’t know exactly how it will be other than there will be a lot of great music, but we will do our best to create the perfect environment for this kind of event. Why did you choose to bring the festival to Miami? Michael League: It was Paul Lehr, our festival director, idea to do the festival in Miami Beach. We wanted to do it in the off season and in a warm, beautiful place for people to escape the cold winter months. Paul is from Miami and very plugged into the scene and of course it’s always best to have someone on their own turf to enhance the festival experience. The weather’s perfect, it’s right on the beach, I think he’s done a beautiful job of organizing it. Hopefully it will provide this kind of musical paradise in a beautiful climate for people who are trying to escape the cold. What can we look forward to at GroundUp Music Festival? 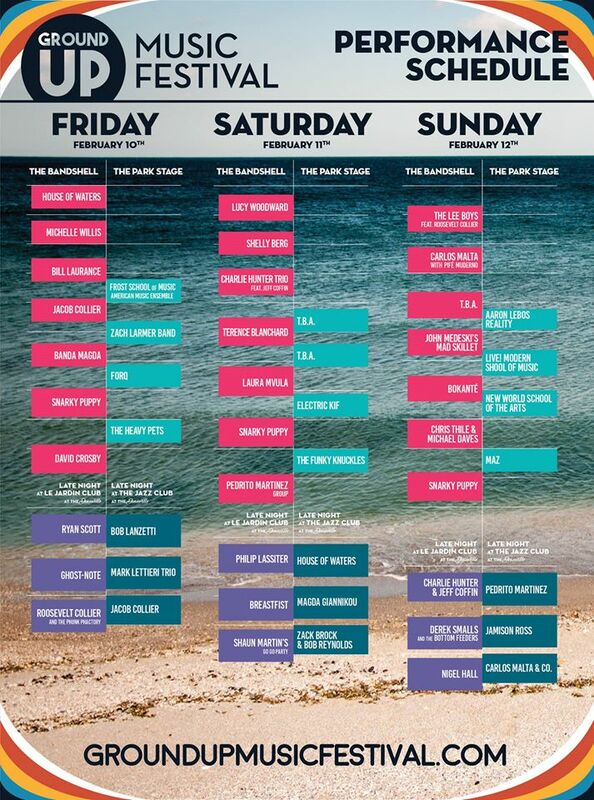 ML: You can look forward to beautiful music from every single act on the bill in a wide variety of genres and styles. Beautiful weather, incredible oceanic backdrop on the beach, tasty food from Miami’s renowned chef Michelle Bernstein, and I would say seeing great performances from artists you know and from artists you don’t. You’ll discover new music and hear nonstop music from 1pm to 4am with the after parties. There will be special events that allow the audience to engage with the performers rather than just watch them, including panels, Q&A’s, and master classes to even scavenger hunts. I think it will be a kind of really 360 experience for festival guests; we’re trying to create a paradise really. GroundUp is more than a festival it is a record label and entertainment company started in 2007. Why did you choose to start your own label? ML: I started GroundUP (in 2012) at the worst possible moment to start a record label, but I think that’s why I did it. People saw that the general public was ceasing consume of paid music, all the labels were tanking and playing it safe, but I felt like now was the time. Now more than ever people need great music, and they need curation. They need people to encourage them about what to listen to the same way I went into a record store today and went straight to the owner and said, “Hey man, what do you think I should check out that I’ve never heard before?” And he showed me some really incredible music that I never heard, and I think that’s why GroundUP is more than a label, an entertainment company, and more than a festival; it’s kind of like your friend that tries to show you stuff that maybe you haven’t heard. Every time I have seen Snarky Puppy you have had a large band with members from around the country and world. Is Snarky Puppy a music collective as much as a band? ML: Snarky Puppy is a collective, in that it’s not the same line up every night. In terms of the mentality, it’s pretty much a band. All the guys that play in the band have played 100’s, if not 1000’s of shows and it very much feels like a family. We’ve done the driving around in a van and the sleeping on couches thing that really makes you feel like a band and not just a bunch of hired guns. So it’s kind of in the middle I think, or maybe it’s just both. How did all of these exception players come together? ML: I initially started the band at the University of North Texas. I was in Jazz Studies department and I got a bunch of my friends form that department to start the group. I then became a part of the gospel and R&B scene in Dallas with the people who play with Erykah Badu, Kirk Franklin, Marcus Miller, and a lot of those people became apart of our growing family. Guys like Shaun Martin, Bobby Sparks, and Robert ‘Sput’ Searight, Caleb McCampbell, Jason ‘JT’ Thomas, and Bernard Wright who was a mentor for me and many of the guys in the band. The list goes on and on but it was kind of like a snowball rolling down a hill. We just started accumulating people who wanted an outlet. I think Snarky Puppy is a band that allows you to play the way you want to play. What’s the fee for vendor space? I’m a Broward County-based crafter of African musical instruments who exhibits periodically at the Bandshell.